This new children’s storybook Bible is filled with the most beloved stories about Jesus, each reflecting how much God loves His children. 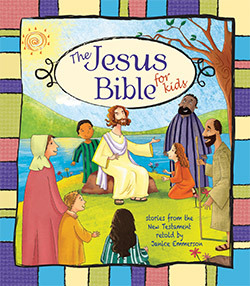 Brightly illustrated and warmly written, each page draws children ages 4 to 8 in, challenging them to learn about Jesus and practice what He teaches. Young ones will hear the story about the good Samaritan and be encouraged to be a good neighbor by showing God’s wonderful love to all those in need. From the story about Jesus calming the sea, children are reminded that as long as Jesus is with them, there is nothing to be afraid of. This refreshing collection of true-to-Scripture stories is sure to become a favorite Bible storybook as the life of Jesus unfolds and touches the very heart of a child.